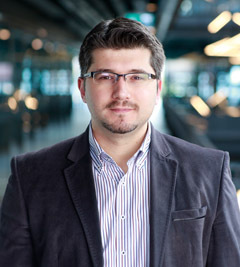 Dr. Hakan Usta is an Associate Professor in the Department of Materials Science and Nanotechnology Engineering at Abdullah Gül University (AGU). He received his B.S. in Chemistry in 2004 from Bilkent University (Ankara, Turkey) and he obtained his Ph.D. in Chemistry from Northwestern University (Evanston, IL) under the supervision of Prof. Tobin J. Marks in 2008. He then joined Polyera Corporation, Illinois Science & Technology Park (Skokie, IL), where he worked as a Senior Research Scientist between 2008-2011 and as a Project Leader between 2011-2013. In 2013, he joined the faculty at AGU.